Cha Shu is a tender, salty, sweet, fatty, melt-in-your-mouth slices of braised pork belly. Though it originated in China, the Japanese adapted it and made it their own. It’s just the perfect topping for a bowl of lovely, warm ramen. 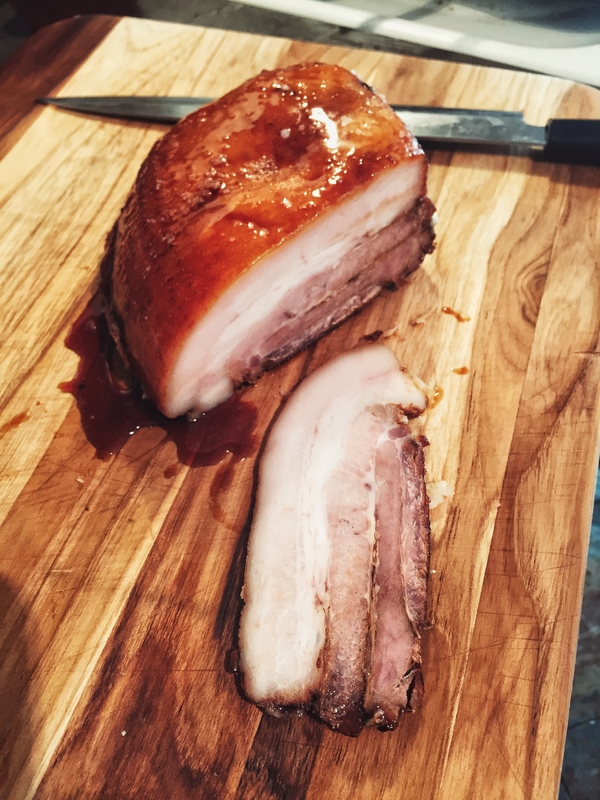 If the pork belly you have is in a long rectangular shape, you can lay pork belly on cutting board and roll up lengthwise, with skin facing out, then tie it up using butchers twine. If you don’t have a shape like that, you don’t have to do this. Sear the surface of the pork belly until the sides except for the skin on top is browned. Then heat 1 cup water with the soy sauce, sake, mirin, sugar, scallions, garlic, shallot, and ginger in a saucepan until boiling. Place the meat in sauce and transfer it to a 135C or 275F oven, turning pork occasionally, until pork is fully tender which should take about 4 to 5 hours. When ready to serve, remove pork belly and strain broth. Slice pork belly into thin rounds, then heat the slices with a blowtorch, charring its surface, then serve.